I have a deep, new respect for farmers and ranchers. For three years now, we have constantly experienced the feeling that the work is never done on the farm. There are animals to feed. Fences to mend. Fields to shred. Fences to mend. Animals to tend to. Fences to mend. Rain to pray for. Fences to mend. Pumpkins to plant. Fences to mend. Weeds to combat. By now, you get the picture. Can you tell what has been the most irksome job on the farm? I would definitely say that the constant upkeep of fencing and the propensity of all animals to test the fencing is practically a full-time job for a farmer. It seems that all animals have the skill to find any weak spot, hole, slight opening, or crooked wire on any fence line ever made and then go through it to get to the neighbor’s land. Like The Outdoorsman reminded me the other night as he was adding yet another strand to the already five-strand barbed wire fence on one side, “Good fences make good neighbors.” I thank God every day that The Outdoorsman is possibly one of the handiest, most versatile men on the planet. He works at his job at Baylor, Scott, and White Hospital all day and then comes home to stretch barbed wire, shred fields, administer medicine to animals, and build chicken coops. Believe me, I do what I can to help with our farm, but the brunt of the heavy work falls on The Outdoorsman. Does he complain one tiny bit? Never. Am I grateful for that? Always. The past two weeks have been hectic. Busy days. Busier evenings. Late nights. Weekends full of activities and projects. 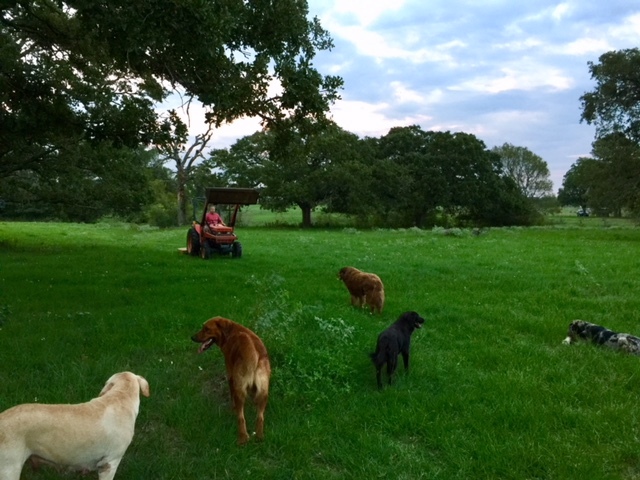 The fact that we are at home tonight and got to walk around gorgeous, lush green pastures with our dogs is exactly what we needed to end our week. The Trooper performed at her football game last night so we have tonight free to spend as we chose. I am sitting in my pajamas writing, reading, and posting pictures and The Outdoorsman is watching his favorite television shows and living vicariously in the Alaskan wilderness. The crazy thing is that he could actually make a go of it in Alaska if given the opportunity. Me? If someone dropped me off in a remote location in Alaska, they would find my skeleton about ten feet from the drop off spot. If I had the Outdoorsman with me, I could help build a veritable fortress and live forever in the frozen wilderness. The man has some serious skills. As I walked around Green Acres tonight, I couldn’t help but see the effects the busyness has had on our land and our house. There are random, misplaced items all over the place. Tarps we were using to protect our pigs and our puppies. Cinder blocks used to cover up openings in pens. Huge cow bones that our dogs dug up from some unknown location sitting around everywhere. Poop from the sheep all over the breezeway. Items strewn throughout the yard. It literally looks like a barnyard! I have to remind myself what The Outdoorsman frequently says: “Remember, it IS a barnyard! It is EXPECTED to look like this!” I can relax and embrace the fact that, apparently, barnyards everywhere take on this crazy look during busy times. The only problem. Our house is starting to resemble a barnyard as well. We have a house built in the 1950s when people, apparently, didn’t need closets or storage. Everything is out in the open for all to see. Well, I have a lot more stuff than the average farm girl (understatement of the century!) so it is difficult to find places to tuck it all away out of sight. The next couple of days will be spent trying to discover some unknown storage options for my things. Our house is so small that it makes an enormous difference when I have things put in their proper places. This weekend, The Outdoorsman and I are planning to do a couple of fun things in addition to our normal farm routine each day. We are thankful for the cooler weather than has finally arrived in Central Texas and for the rains that have relieved our land from months of drought. Fall is finally here and we are grateful for the arrival of the cooler weather that soothes our souls and allows us to enjoy our everyday tasks on the farm. We hope you enjoy your weekend as well.